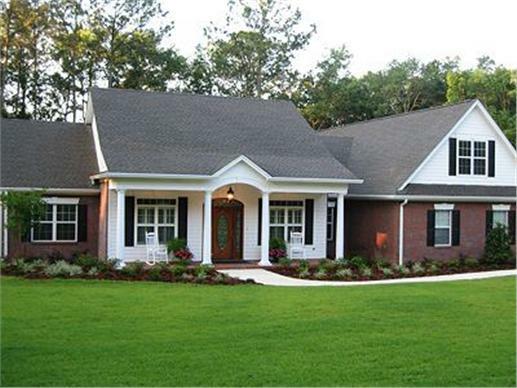 “Simplicity is beauty” truly captures the essence of today’s ranch house plan. Once criticized as having no style, the rambling one-story structures, with their open floor plans, large windows, and sliding glass doors to a rear patio are basking in a revival these days. Typically built close-to-the-ground with a low-pitched roof, minimal exterior and interior decoration, the “ranch” really caught the imagination of America’s middle class in the late 1940s through the 1960s before falling out of favor in the early 70s as buyers and homebuilders turned to “McMansions.” But with a few modern twists to the traditional ranch house design, today’s ranch homes are attracting both families and empty nesters. Trends, populations, and demographics have shifted dramatically. And now, a generation later, the ranch is back – “resurfacing” like an old friend. Older ranch houses built in the suburbs during the 50s and 60s are now getting a second look from both the young and old. Homebuilders and prospective home buyers have embraced new construction of the American ranch house – for some of the very same reasons why they were popular to begin with – which now are packed with modern features and amenities but also can fit within a buyer’s budget. Traditional ranch with shuttered windows and Southern country porch design includes an optional bonus room over the garage. Learn more about this plan. the front and wrapping around the house. Check details here. 1. 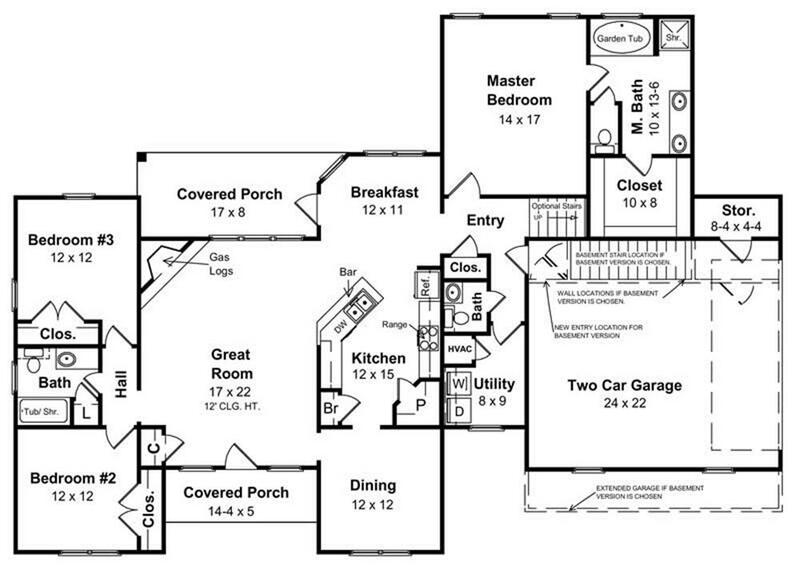 Classic Ranch Floor Plan Features. The charming features still exist: large windows that allow an abundance of natural sunlight; sliding glass doors that open to a patio or garden, and open floor plans that create one harmonious room that combines living room, dining room and kitchen. For aging Baby Boomers, the practicality of a single-level home is attractive. With no stairs to navigate, a one-story ranch offers comfort and ease. These plans are also more likely to be wheelchair accessible or easily modified as such. 2. Luxury Amenities without Breaking the Bank. These “new” ranch style designs often include luxurious master bedroom suites with walk-in closets and a spa-like bathroom. The additional bedrooms are often split away from the master bedroom allowing for more privacy and can often easily accommodate in-law quarters or suite. Other “extras” can often be found in these new ranch homes such as an in-home office or workstation, a large kitchen with an island, a grilling porch, or an indoor fitness room. 3. Affordability and Flexibility of Ranch Building Plans. First time home owners find the ranch house’s affordability and flexibility very appealing. Ranch house designs work well in a wide variety of exterior surfaces – from wood siding to brick and stone. Front or reach porches can be easily added into the original design or often as a future addition. Depending on the geographic region and lot specifics, ranch house plans can be easily built on a slab foundation or with a basement or daylight basement. Like a “little black dress” the ranch can be simple, informal or luxurious and sophisticated. 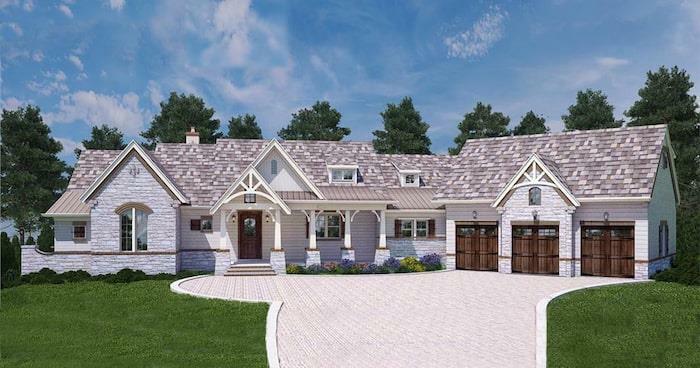 Below is an example of a ranch house plan designed with a traditional look but with modern amenities and conveniences. 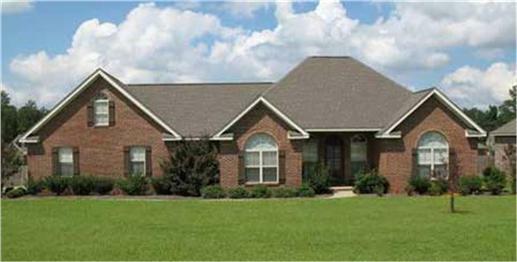 The brick exterior of this ranch also keeps exterior maintenance fairly low. An optional basement as well as a potential bonus room over the garage allows for additional space for growing families or storage. 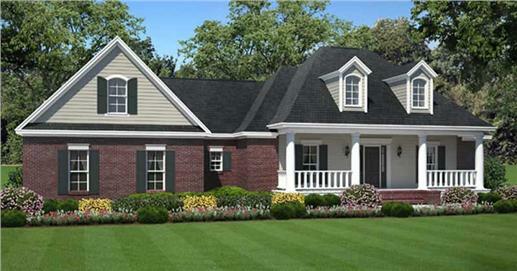 The variations in ranch design and style are too great to display here, but you can search ranch style house plans and view many more options online. A simple but elegant ranch home with a great interior floor plan (View Plan #141-1153). Floor plan of a ranch style house plan designed for today’s living with an optional basement. (Plan #141-1153). Depending on your lot, ranches can really allow the homeowner to take advantage of the outdoors given its single level floor plan design. Homeowners can walk out from almost any room into the property’s flower gardens/landscapes, and perhaps even modified versions of a Japanese garden near the entryway. Perfectly manicured lawns can complement colorful shrubbery. Their rear patios can open up to swimming pools and decks for outdoor entertaining and relaxing. Increasingly, builders of ranch style homes are completing them with attractive BBQ areas or outdoor kitchens. If there is a need to expand to accommodate growing families, the open floor plans can be rearranged to suit the homeowner’s purposes. Because the ranch has a sprawling layout, additions can be made without disrupting the rhythm of everyday life. What’s not to like? Well, since as far back as the 17th century, residents of North America have appreciated – and even loved – the ranch style home. Although ranch houses gained tremendous popularity after World War II, their origins can be traced to the North American Spanish Colonial architecture of the 17th to 19th century. Homes built during that period were simple, linear single-level frameworks made of a mixture of adobe brick, wood, stucco and glass. They were informal and functional, featuring low roofs with wide eaves to shade the windows from the sun and heat. Interior courtyards surrounded by a U-shaped floor plan and large front porches extending across the long façade were quite common. However, the first modern-day ranch house did not come about until the Great Depression. It is attributed to Southern California architect Cliff May in 1932. May designed, built and sold the O’Leary House in San Diego when he was just 23 years old. The American ranch house was easy to build and expandable because of its horizontal, spread out layout; and above all, inexpensive. No wonder post-WWII families and then first-time Baby Boomer homeowners would end up loving it. By the 1950s and 1960s, ranch houses were all over suburban areas of the country, with architects and builders making variations to adapt to a particular region. Single-floor ranch style houses have a large presence among Tennesse home plans, for example, as well as other regional areas like North Carolina and South Carolina. To get away from the “boring” tag critics attached to the ranch house, California developers like Joseph Eichler and Robert and George Alexander gave the ranch home a touch of modern flair and sophistication. Eichler houses adhered to the traditional one-story concept but had these other features: post-and-beam construction, concrete slab foundation, open-air courtyard at the entrance, floor-to-ceiling windows and exposed ceiling beams. As innovative as the Eichler and Alexander homes were, Americans’ ideas and fascinations veered toward the more formal and elaborate designs. The “simple” ranch was set aside. After over two decades of economic boom post World War II, many homeowners looked to bigger and grander homes as a clearer manifestation of success and wealth. Increasing land prices and smaller lots meant more two-story houses, with intricate exterior and interior ornamentation. More detrimental to the ranch house was the decision of developers to use inferior materials in order to cut costs. By the 1970s, so-called neo-eclectic homes had become quite popular, with their fusion of different architectural styles and “dramatically elevated rooflines, grand entryways, and traditional detailing. Many “classic” ranch houses were either dramatically remodeled or torn down to clear way for these larger, more ornate homes. Although much of the exteriors of these “neo-eclectic” homes were inspired by Northern European or Italian homes from the 18th and 19th centuries, these homes often maintained the typical floor plan features of the American ranch – open floor plans, patios, and attached garages – that had so attracted families to them in the first place. Across the United States today, homeowners and builders are now actively building new ranch style homes – as Americans recall what made these homes so special. At the same time, ranch home preservation organizations – from Palm Springs, California, to Texas Hill Country – now attract volunteers and homeowners eager to save and preserve classic to retro American ranch homes. Often, homeowners are even seeking building materials, fixtures and furniture that evoke the "golden age" of the ranch home. After two decades of being out of favor, the ranch house is back! And what's not to love?